This fine carving is of an American Eagle made by a follower of John Bellamy. The style, carving and measurements make it an exact creation. It was said to have come from a Massachusetts home in the 1950's, and had been made at the turn of the 20th Century. Presented is a carved American eagle with excellent detailing made by a follower of John Bellamy. The best known carver in his day was John Bellamy whose many works live on and have bee appreciating in price since 2000. It is the type of work seen in his carvings of the mid 19th Century that were very popular in New England homes. The eagle in this form was also frequently used to grace the sterns of American sailing ships. This example is as perfect an example of a Bellamy style eagle as you can find. It was said to have been made near Boston in the 1950's. FOR DETAILS OF HIS WORK SEE, "John Haley Bellamy, Carver of Eagles" by Yvonne Brault Smith, 1982, PORTSMOUTH MARNE SOCIETY, Portsmouth, NH. This book has pictures, dimensions, design drawings and a detailed biography of Bellamy and a reprint of The Magazine of Antiques' "Bellamy's Style and its Imitators". In the Summer of 2005 a Bellamy eagle brought $600,000 in a New England Auction with 1950 recreations made by the Artistic Carving Company of Boston selling in the $2000 to $3500 range at the same auction. We only have one of this style with "WELCOME" on the banner. The most famous American nautical wood carver was John Haley Bellamy, who worked out of Kittery, Maine, in the 1860s and 1870s. Bellamy made his living by carving eagles for ships and also for the home. Bellamy's eagles stood out from all other eagles and still do, as the line and design were perfect. They look very realistic. 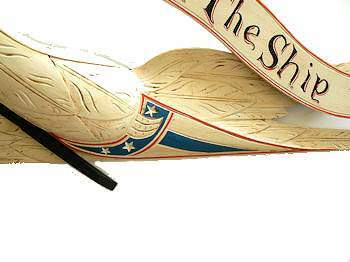 Bellamy's stern boards were always painted red, white and blue, and often were carved with adages, such as "Don't give up the ship." His eagle's beak also had a distinctive straight vertical edge. In August, 2005, a Bellamy eagle brought $600,000 in a New England Auction - evidence of the steep appreciation of marine carvings by Bellamy eagles in recent years. His work represents the high end of nautical carvings in terms of value. Many carvers copied his style and some still do. Unfortunately we can not verify its provenance other than it fits all of John Bellamy's known design parameters, and was said to have come from Massachusetts in the 1950's. OUR UNCONDITIONAL “NO NONSENSE” GUARANTEE: If not completely satisfied with your purchase it may be returned, if without damage, within three days of receipt in its original condition and packaging. Returns must be insured for their full value. All that is required is a prior email authorization by us for the return. Shipping, packaging and handling is refundable within the continental United States if we are at fault. SHIPPING & PACKING: Due to the size and weight of the carton, the cost of shipping, packing, handling, and insurance to your destination is an additional charge. You may email us to get these costs. We price our shipping honestly, but we expect to be reimbursed for the nominal cost of packaging materials and handling. This great eagle will make a fine wall hanging for your home, den, office or boardroom. Buy now with confidence! This Fine Eagle Has Been Sold. Thank you! Presented is a carved American eagle with excellent detailing made by a unknown follower of John Bellamy. Bellamy was the best known carver in his day. His many works that have survived continue to be highly collectible, but are now selling for much less then they did in the heady days of the early years of this decade. It is the type of work seen in his carvings of the mid 19th Century that were very popular in New England homes. The eagle in this form was also frequently used to grace the sterns of American sailing ships. This work is as perfect an example of a Bellamy eagle as you can find without paying the $15-$18000.00 for which this size eagle sells. 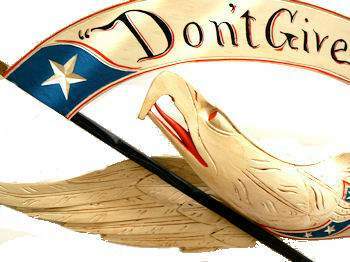 JOHN BELLAMY'S EAGLES: The most famous American nautical wood carver was John Haley Bellamy (1836 - 1914), who worked out of Kittery, Maine, in the 1860s and 1870s. Bellamy made his living by carving eagles for ships and also for the home. Bellamy's eagles stood out from all other eagles and still do, as the line and design were perfect. They have a signature appearance. Bellamy's stern boards were always painted red, white and blue, and often were carved with adages, such as "Don't give up the ship." His eagle's beak had a distinctive straight vertical edge. In August, 2005, a Bellamy eagle set a record at $600,000 in a New England Auction - evidence of the steep appreciation of marine carvings by Bellamy eagles years prior to 2009, and their subsequent decline. His work represents the high end of nautical carvings in terms of value, and collecatbility. 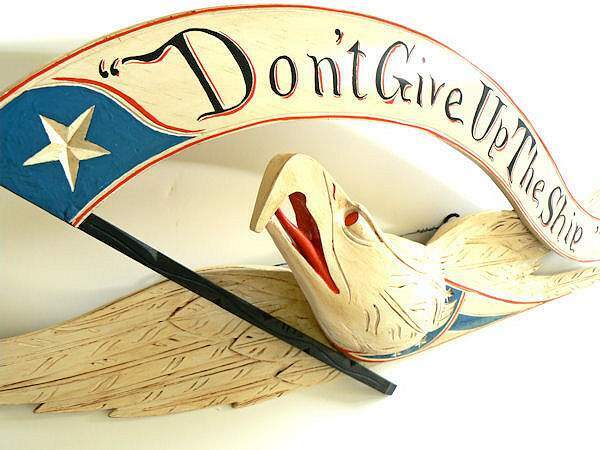 This fine carving is of an American Eagle made by a follower of John Bellamy. The style, carving and measurements make it an exact recreation. FLAT RATE SHIPPING & INSURANCE to 48 contiguous States $20.00. This great eagle will make a fine wall hanging for your home, den, office or boardroom.